airflow's pop'n music banner, as of pop'n music 16.
airflow's pop'n music old banner. The girl in airflow's name is Tomo (トモ), according to VJ GYO on this 8th style Q&A (archived). airflow was added to pop'n music 10 on February 4th, 2004 via ee'MALL 2nd avenue. 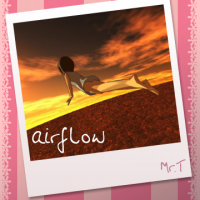 Before pop'n music 15 ADVENTURE, airflow's songwheel genre was airflow. airflow's songwheel genre was typoed as インストゥルメント in pop'n music 15 ADVENTURE's mobile website. In pop'n music, airflow is infamous for its weird timing. beatmania IIDX difficulty rated from 1 to 7+ in 8th and 9th style, 1 to 8 in 10th style, 1 to 8+ in 11 IIDX RED, and 1 to 12 from 12 HAPPY SKY onwards. ※ Denotes chart has been revised from its earlier BEGINNER chart (total notes: 93). This page was last edited on 17 April 2019, at 18:20.